Assessments of the economic cost of a rise in sea-level are often limited to estimating the current value of structures and output in low-lying coastal areas. This column argues that understanding how economic activity will move when faced with flooding is key to correctly evaluating the cost of permanent inundation. When using a high-resolution dynamic spatial model of the world economy, combined with state-of-the-art local projections of sea-level rise for the next 200 years, the cost is substantially lower than when ignoring adaptation through moving. There is huge heterogeneity across space though, with some low-lying coastal areas hit particularly hard. Climatopolis: How will climate change impact urbanites and their cities? Measuring the economic impact of climate change is naturally challenging. Climate change is a global phenomenon that affects localities differentially, evolving in complex ways over long periods of time. In response to its most salient consequences, agents react by changing their behaviour. Some move to areas that are cooler or are not subject to inundation or regular storms, some others prefer to invest in alternative locations and renewable energy, and yet others decide to ramp up their savings for a more uncertain future. These reactions, and their aggregate consequences, ultimately determine the economic cost of climate change. One of the main consequences of climate change is the rise in sea levels due to the thermal expansion of the oceans and the melting of ice sheets. A higher sea level can cause permanent inundation along coastlines, potentially threatening the future of many cities. Of course, climate change can also pose other more temporary threats to coastal areas, such as an increase in the frequency of storms and episodic flooding. Evaluating the economic impact of permanent sea-level rise is relevant not only for articulating policies aimed at reducing global warming, but also for designing countervailing measures, such as the building of levees and the introduction of relocation incentives. As sea levels rise, the effect on locations along the coastline will be heterogeneous. One reason is that the elevation of coastal areas varies tremendously. Another reason is that, due to ocean dynamics and tectonics, sea-level rise will not be uniform across space (Kopp et al. 2014, 2017). Hence, evaluating the economic impact of coastal flooding with even basic accuracy requires incorporating spatial detail. Using aggregate loss functions that relate the future path of the aggregate economy to the evolution of climate variables, as done in the Intergovernmental Panel on Climate Change (IPCC) reports or the work of Nordhaus (2008, 2010), would therefore not be appropriate for assessing the effect of sea-level rise. However, the introduction of spatial detail has typically come at the cost of ignoring dynamics and adaptation. Assessments of coastal flooding have often reverted to the simple addition of the current economic activity that is threatened by the rising sea level (as in Dasgupta et al. 2007). So far, the few studies that introduce some dynamics do not go beyond using very aggregate future projections to measure the economic activity that is at risk (as in Nicholls 2004). It should be obvious that evaluating the economic cost of a rise in sea level by estimating the current value of buildings or output at risk of being inundated in the future is not convincing. First, the capital and structures in the inundated areas will depreciate completely in the next 50 years or so. This implies that we will have to rebuild them by the time they are under water. Remember, sea-level rise occurs very gradually – the IPCC panel predicts an average increase of a bit less than one meter over the course of the 21stcentury. Hence, the cost of rebuilding the capital and structures that will flood in the future should not be part of the evaluation of coastal flooding; it is only to the extent that there is a difference in the cost of rebuilding structures in another location that we should worry about them. Second, people will react to flooding by moving to a new location, where they will spend and invest. Similarly, firms will produce, invest, and innovate in new locations where they can find customers and employees. Economic activity will simply adapt and relocate. Of course, moving is not free, but these costs are not equivalent to production in the flooded areas. This insight points to an additional drawback of using aggregate loss functions when evaluating the economic impact of climate-related phenomena. Because such loss functions are based on inevitably rigid relationships between climate variables and aggregate economic output, they fail to incorporate nuanced behavioural responses. As is the case with many old approaches in macroeconomics, they are subject to the Lucas critique: shocks and policies can make agents react in ways that will not satisfy the aggregate relationships estimated using available data. A proper evaluation of coastal flooding therefore requires a high-resolution-dynamic model that incorporates behavioural responses, such as costly mobility, trade, and investments. In a recent paper, we proposed and calibrated such a spatial growth model at a 1°x 1°grid cell resolution (Desmet et al. 2018a). 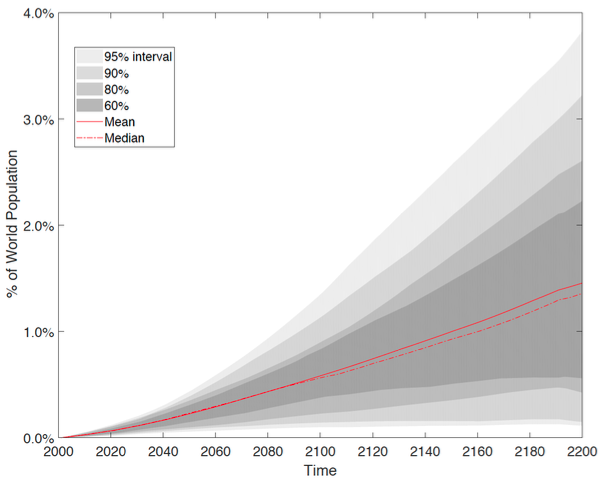 We have joined forces with four climate experts to use state-of-the-art local projections of sea-level rise for the next 200 years to evaluate the cost of permanent inundation (Desmet et al. 2018b). In this latest paper, we evaluate the dynamic effects of permanent flooding on population, real GDP, and welfare in each of the more than 17,000 grid cells with positive land mass. These simulations take into account that agents can trade, move, and invest, subject to costs. We focus on the average cost of coastal flooding, but also on its variability given the scientific uncertainty about its future severity. We are also interested in the distribution of these costs across locations and time. Our baseline results show that permanent inundation will reduce the present discounted value of real GDP by an average of 0.19% under a medium emissions scenario (and by 0.24% in the case of welfare). Coastal flooding is estimated to displace about 1.46% percent of the world population by 2200. In terms of uncertainty, we find that 95% of future sea-level rise realisations imply welfare losses between 0.08% and 0.45% in the intermediate emissions scenario. When considering an extreme emissions scenario, the maximum loss in real GDP can be as large as 1.36%. Figure 1 presents the fraction of global population displaced by flooding over time. Source: Desmet et al. (2018b). These costs are by no means trivial, but they are an order of magnitude smaller compared to when we ignore any form of economic adaptation. In particular, real GDP loss would increase from 0.1% to 4.5% in the year 2200 if we were to follow a naïve evaluation approach with no economic adaptation – that is, if we were to simply consider as the cost of flooding the fraction of real GDP that is produced in areas that are predicted to flood. In the paper, we present results for a variety of different evaluations with limited adaptation and show that the costs depend crucially on properly modelling the dynamic behavioural response to flooding. This underscores the importance of using a model where agents decide where to live, what to consume, what to trade, and how much to invest. This does not imply that economic adaptation is free – moving to higher ground is costly. We simply acknowledge that agents do not disappear when their original homes and workplaces are under water. Of course, policy does not always facilitate such adaptation. For example, providing aid to locations that face flooding risks, instead of encouraging mobility and spatial adaptation, may incentivise a failure to adapt. More generally, the incentives of local officials to sustain their own localities (even when this could hurt the long-run interests of their constituents) may be an obstacle to much needed economic adaptation. Our quantitative findings suggest that hindering adaptation may substantially increase the long-run cost of permanent flooding. Needless to say, coastal flooding will have dramatic consequences in some locations, but will have a negligible impact in others. For example, about 4% of coastal grid cells are estimated to lose more than 10% of their population due to flooding by 2200, whereas 80% of coastal grid cells actually gain population: it pays to have a high coastline! Cities like Amsterdam, Bangkok, Ho Chi Minh City, Kolkata, Miami, Shanghai, and Tianjin all lose 20% or more of their real GDP in the most extreme scenarios, while other large coastal cities like Barcelona, Los Angeles, Lima, or Sydney might actually gain slightly as people move away from the more heavily affected locations. The nuance introduced by a spatially disaggregated dynamic model with economic adaptation pays off. Without it, we are left with rough aggregate estimates that mean little to economists and policymakers. Dasgupta, S, B Laplante, C Meisner, D Wheeler and Y Jianping (2007), “The impact of sea level rise on developing countries: A comparative analysis”, Policy Research Working Paper Series 4136, World Bank. Desmet, K, DK Nagy and E Rossi-Hansberg (2018a), “The geography of development”, Journal of Political Economy 126: 903-983. Desmet, K, R Kopp, S Kulp, D Nagy, M Oppenheimer, E Rossi-Hansberg and B Strauss (2018b), “Evaluating the economic cost of coastal flooding”, CEPR Discussion Paper 13128. Reisinger, R K, and A Pachauri (2007), “Climate change 2007: Synthesis report. Contribution of Working Groups I, II and III to the Fourth Assessment”, IPCC Geneva. Kopp, R E, R M Horton, C M Little, J X Mitrovica, M Oppenheimer, D J Rasmussen, B H Strauss and C Tebaldi (2014), “Probabilistic 21st and 22nd century sea-level projections at a global network of tide gauge sites”, Earth’s Future 2: 383–406. Kopp, R E, R M DeConto, D A Bader, C C Hay, R M Horton, S Kulp, M Oppenheimer, D Pollard and B H Strauss (2017), “Evolving understanding of Antarctic ice-sheet physics and ambiguity in probabilistic sea-level projections”, Earth’s Future 5: 1217-1233. Nicholls, R J (2004), “Coastal flooding and wetland loss in the 21st century: Changes under the SRES climate and socio-economic scenarios”, Global Environmental Change 14: 69–86.